EnGen™ Spy Cas9 NLS NEB #M0646 is also available now. Cas9 Nuclease, S. pyogenes, is an RNA-guided endonuclease that catalyzes site-specific cleavage of double stranded DNA. The location of the break is within the target sequence 3 bases from the NGG PAM (Protospacer Adjacent Motif) (1). The PAM sequence, NGG, must follow the targeted region on the opposite strand of the DNA with respect to the region complementary sgRNA sequence. Cleavage occurs three nucleotides upstream of the PAM sequence (shown in red). sgRNAs are complimentary to the strand of DNA opposite of the PAM. Reactions were set up according to recommended conditions, and cleavage products were resolved on a 1% agarose TBE gel. Input DNA is PvuII-linearized pBR322 plasmid DNA. 1,000 nM is equal to 159 ng/μl. 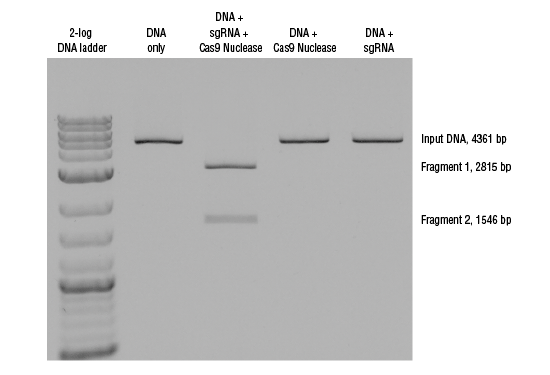 If planning to use higher concentration Cas9 Nuclease, S. pyogenes (M0386T and M0386M) for in vitro digestion of DNA, the enzyme should be diluted to 1 µM using Diluent B (NEB #B8002S) prior to the reaction assembly. Jinek M. et al. (2012). Science. 816-821 doi: 10.1126/Science.1225829. Epub 2012 Jun 28..
Why do I observe incomplete digestion? Why does digestion efficiency differ between two SgRNAs? Does NEB provide plasmids for gRNA cloning? 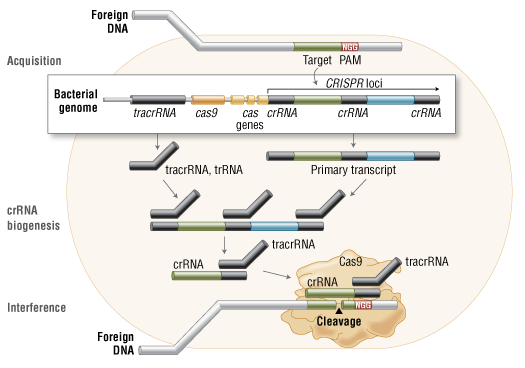 Does Cas9 Nuclease contain a nuclear localization signal (NLS)? Is Cas9 Nuclease fused with a N-terminal 6XHis tag?